From the moment they hit the ice on Saturday night, it was obvious that the Kootenay Ice ‘out-plaid’ their opponent. Wearing special uniforms inspired by Canadian-icon Don Cherry’s famous outlandish suits, the team skated their way to a 5-3 victory over the Everett Silvertips and looked good while doing it. According to winger Colton Veloso, who had a goal in the win, they may just have to take up the tartan-look from here on out. 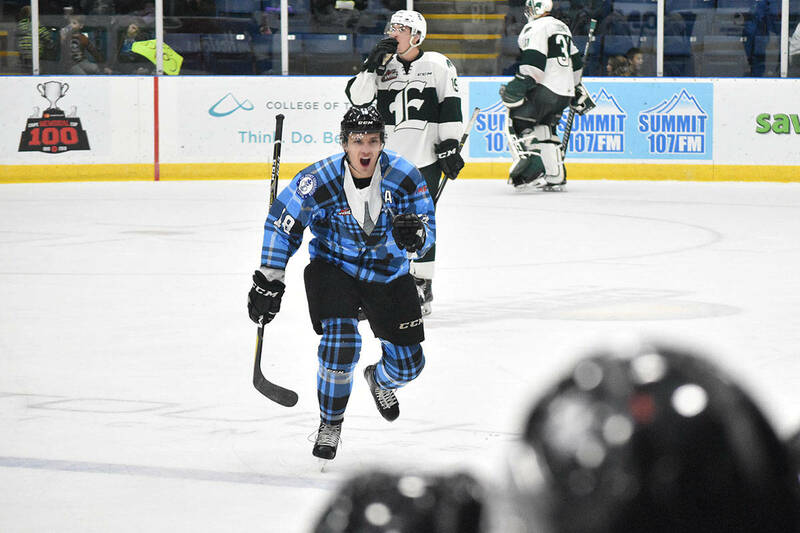 The jerseys were part of the league-wide ‘WHL Suits Up with Don Cherry to Promote Organ Donation’ cause and 2,457 Cranbrook fans were on hand to witness the bold look and the impressive play that came along with them. Entering the night on a four-game losing streak, the Ice came out flying against Everett, a team who was playing the very last game of a nine-game road trip. Kootenay put up 15 shots in a very face-paced back-and-forth opening frame and grabbed a 1-0 lead thanks to a highlight reel goal. Newcomer Jeff de Wit, playing in only his second game with Kootenay, opened the scoring just six minutes in with a toe drag and top-corner wrist shot off the rush that beat Everett goalie Dorrin Luding. Although the Ice’s strong opening was hampered in the second period by an onslaught of penalties and Everett capitalized on their sixth man advantage of the game, the Ice showed strong resistance in the following shifts. Hard work by Peyton Krebs in the corner led to a pass out front to Veloso and the Ice regained their lead just a minute after the ‘Tips had tied it up. It was enough to send them into the second intermission with a lead. In the third, however, Everett tied the game again just over a minute in with leading-scorer Patrick Bajkov roofing the puck after finding himself alone in front. Five minutes later, Riley Sutter gave the opposition their first lead of the night when he popped one by Ice netminder Bailey Brkin. Once again, the Ice managed to stay strong and the fourth-line tied the game at the midway point of the period with Michael King crashing home a rebound from a Gilian Kohler drive. Minutes later, Brett Davis won an offensive-zone faceoff and Vince Loschiavo wired home the game-winning goal, sending Western Financial Place into a frenzy that would last until the final buzzer. Adding to the excitement, Jeff de Wit scored on an empty net to earn himself his second goal and first star honours. As for the game-winner, Patrick credited hard work for Loschiavo’s big night. “I’m super happy for [Loschiavo] to be rewarded,” said head coach James Patrick. “ He’s gone through a tough spell, [but] he is committed to getting better and to putting in the extra work. Overall, the shots were 40 to 32 in favour of Everett and Brkin had 37 saves in his second career WHL win. While Patrick was happy with the win, the amount of penalties the team took still bothered him and he hopes that the team realizes they need to be more disciplined to be successful on a regular basis. “I thought it was a gutsy effort to come back and stay with the program, [but] at times we made it really hard on ourselves,” he said. “We created a lot of chances, [but] we’re not going to have success taking that many penalties. For the night, Kootenay went zero for two on the power play and let in one goal on six penalty kills. With the win, the Ice now have a record 3-5-1-0 through the first nine games of the season. The team is back in action, at home, on Tuesday night as they take on the Moose Jaw Warriors (7-1-0-0) in what should be another tough test. 1st Period-1, Kootenay, de Wit 2 (Taphorn), 5:58. Penalties-served by de Wit Ktn (too many men), 9:18. 2nd Period-2, Everett, Christiansen 1 (Sutter, Dewar), 16:46 (PP). 3, Kootenay, Veloso 2 (Krebs, Pouliot), 17:28. Penalties-de Wit Ktn (inter. on goaltender), 1:29; Kroeker Ktn (high sticking, high sticking), 5:18; Fleury Ktn (hooking), 12:01; served by Krebs Ktn (too many men), 14:48; Bajkov Evt (interference), 18:48. 3rd Period-4, Everett, Bajkov 4 (Fonteyne), 1:07. 5, Everett, Sutter 7 (Davis, Wylie), 6:59. 6, Kootenay, King 3 (Kohler, Bodak), 10:51. 7, Kootenay, Loschiavo 3 (Davis), 13:02. 8, Kootenay, de Wit 3 (Kroeker, Hines), 18:59 (EN). Penalties-Richards Evt (interference), 4:41. Shots on Goal-Everett 15-14-11-40. Kootenay 15-11-6-32. Power Play Opportunities-Everett 1 / 6; Kootenay 0 / 2. Goalies-Everett, Luding 3-5-0-0 (31 shots-27 saves). Kootenay, Brkin 2-2-1-0 (40 shots-37 saves).